Part 3, is entitled “Nothing has Gone Right Since 1910”: Christian Science After Death. Starting on page 170 and continuing through page 257, this section has eleven sub-sections and a ream of photographs. Having grown up in Christian Science, I had heard about some of the incidents discussed, they all happened well before my time (this chapter discusses just after Ms. Eddy’s death up until the mid-1970s). As I heard them, they were more apocryphal tales than historical events bolstered by research and footnotes. Even with this background knowledge, there were still some sections that made me wonder if I was reading an article from The Onion. This section also covers a number of topics that I knew very little about, several of which I will touch on. Augusta Stetson suggested to the press that the Board of Directors had posted a guard to make sure Ms. Eddy didn’t rise from the dead. Others thought the guard was there to welcome their Dear Leader back. Eventually a church spokesperson was forced to make a statement that Christian Scientists “do not look for her return to this world” (GPC 172). This is something I’ve never been quite able to wrap my head around, for all that matter is unreal, the accumulation of material wealth is a “demonstration” — God is supplying! “The expectation of perfect wealth, along with perfect health, follows from Eddy’s teachings about a perfect world” (GPC 191). Wealth and material accumulation is “an expression of spiritual riches” (GPC 193). The most notable example is of Carol Channing — preforming with a broken arm, high fever, in a wheel chair, in a neck brace, and while suffering from allergic reactions to her hair dye, all the while glorifying and romanticizing the image of Christian Scientists “never missing a day of work” (GPC 213-4). Fraser says Channing’s endurance “verges on masochism.” I agree, there is a strong masochistic streak that runs through the Christian Science community, Ms. Eddy reminds us that we are suffering because we want to be, because we have not yet aligned our thought properly with God, it is our failing to do so that is causing our suffering. We must put up a good fight and emerge from our battle with error victorious. The Board actively attempted to suppress Edwin Franden Dakin’s book on Ms. Eddy — their attempts backfired. As one reviewer wrote “The total effect of his work is sympathetic; it is the facts that alienate us….” (GPC 219). Christian Scientists put out a “threefold attempt” to stop the book — attempting to stop the publication, when that failed, visiting libraries and bookstores, and letters to every newspaper or magazine that reviewed it. They threatened boycotts, and it is clear that the campaign was organized by the top levels of The Mother Church (GPC. 222-3). The unauthorized works of Arthur Corey. Corey published Christian Science Class Instruction and Behind the Scenes with the Metaphysicians, with the intention of making Christian Science more accessible. Corey was one of the few Christian Scientists to acknowledge the dangers posed to children, and was “particularly scathing about those who pressed on with Christian Science treatment even when it became painfully absurd and absurdly painful” (GPC 237). Corey also spoke out about Ms. Eddy’s own use of medicine and eyeglasses, and pointed out the illogic of accepting dental care, but not medical care. The Kerry Letters – A series of letters written by Reginald Kerry charging the church with corruption. The letters get quite heated, charges of immoral behavior of the Board. The letters are not currently available online. The Kerry Letters were the impetus for the Church to run several editorials in the Christian Science Monitor and religious periodicals, that homosexuality was immoral and could be healed through Christian Science, soon after, periodicals began to run testimonies by those claiming to be “healed” of impure desires (GPC 255). This chapter was quite an eye-opener and a very firm reminder that the Christian Science Church, for all it’s “divine inspiration” is run by humans, with their own agendas, bickering and infighting. It was like picking up a log and seeing all the little creepy crawlies underneath scurrying away from the light, and there are many creepy crawlies that the Church would prefer to remain hidden. Fraser notes the Church set itself up for failure as it forbids Christian Scientists to write, debate, or discuss the Church and its teachings. There are no ways to air grievances, or seek guidance. The disgruntled have no official channels so they make their own. 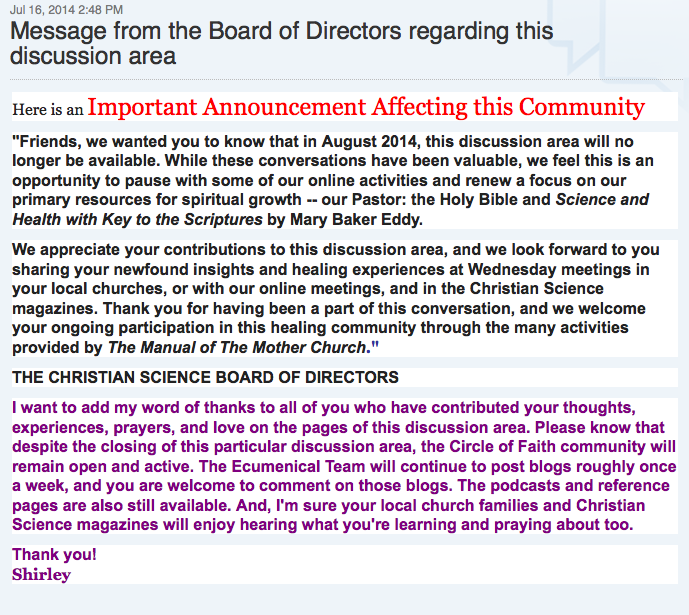 Part 4, is entitled “God’s Law”: Christian Science Goes to Court. Starting on page 261 and continuing through page 339, this section has only seven sub-sections. This was a particularly challenging section for me to read, more than once, I found I had to put the book down and come back later, the atrocities committed while practicing Christian Science are numerous, and many of the stories echoed experiences I’ve heard from friends and fellow former-CS. While all of God’s Perfect Child makes people face uncomfortable truths about Christian Science, Part Four made me particularly uncomfortable as it dealt with the (lack of) treatment of children, and the “treatment” meted out in Christian Science Sanatoriums — where Christian Science Nurses provide care. The American Medical Association and Christian Science both got their start in the mid-1800s. The AMA focused on public health policy, rooting out quacks, and promoting medicine based on scientific criteria (allopathic medicine). Early on, several Christian Science Practitioners were tried for manslaughter (or murder) following the death of their patients. The CSPs cases were often dismissed because there was no ability to conclusively prove that medical science could’ve saved the patient’s life, and that CSPs had not committed any criminal act because they were preforming a religious, not medical service (GPC 262). Starting in the late 1800s, Christian Scientists rallied and pressured legislatures to pass statutes exempting Christian Scientists from medical licensing requirements. This went smoothly until modern medicine began to out-heal Christian Science in key areas: namely serious illness and contagious disease. Deaths in the general population began to decline, and Christian Scientists continued to die (GPC 270). Christian Scientists argued that “children died under medical care as often, if not more often than, children under Christian Science care” and in 1902 this came across as a reasonable defense (GPC 271). Christian Scientists have successfully lobbied for exemption from criminal and civil child abuse laws in Arizona, for fees of CSPs and CS Nurses to be deducted as medical expenses, and religious exemptions from immunizations (GPC 274). The Church has gone as far as to publish booklets for each state with lists of exemptions. Christian Scientists also lobbied insurance companies, gaining much needed “recognition” — now it is not just a religion to be protected by the first amendment, it is now a “proven” and “effective” healthcare system — proven by the Church’s own claims as published in the Church’s own periodicals (GPC 275-6). This was a particularly difficult section for me to read as it discusses children and Christian Science, starting with a focus on Rita Swan and the formation of C.H.I.L.D. it is a gut wrenching read. This section also touches on measles outbreaks at Principia College, as well as polio outbreaks at the Daycroft School, in Greenwich Ct, a diphtheria outbreak at a Christian Science camp in Colorado (GPC 303), as well as several other heart wrenching stories of children suffered greatly as their parents chose to rely on Christian Science for healing. I was going to try and talk further about Chapter Four, but I can’t bring myself to go back through it right now. It really speaks for itself — and speaks volumes about Christian Science as an alternative health care method. If you are only going to read one book about Christian Science, I highly recommend God’s Perfect Child: Living and Dying in the Christian Science Church by Caroline Fraser. I was initially going to read through God’s Perfect Child in a few weeks and just make it one post, but I found it to be a very challenging read for me (I’ve had to put it down several times and walk away for a few days), and so densely packed with information that it deserved more coverage. I first came across God’s Perfect Child in the very early 2000s, as a high school senior, or possibly freshman at Principia. I acquired my copy from local used bookstore where it was tucked away in the corner with all the other religion-related volumes, next to several trade editions of Science and Health (the ugly red/green one) – they always had at least two or three copies and my mother often picked up a stack for $3 each to leave by the front door to hand out to people along with their housewife-based-pyramid-scheme samples. I read it with skepticism, at that time I was still heavily involved in Christian Science, attending Sunday School regularly, and was either in the process of applying to or already at Principia College. I undoubtedly left the book laying out around the house, but if my parents noticed it, they never said anything to me about it. I dismissed most of the book as part of the no true Christian Scientist fallacy (similar to the no true Scotsman) and reasoned that it couldn’t be Christian Science that was at fault — it was divinely authorized! There were documented healings! It worked! It had to be the people practicing it wrong, besides, no true Christian Scientist would do whatever irrational thing that was happening. I’ve since learned that Christian Science adherents come in a range from Die Hard Committed to Incredibly Pragmatic, thankfully my parents — who were converts — were more pragmatic than some and less committed than others. It has been several years since I read God’s Perfect Child, in those years I’ve graduated Principia, moved out, married a fellow Christian Scientist (now fellow atheist), struggled with my faith, realized it is not the right path for me, started this blog, and now I think it is time to go back to God’s Perfect Child with a different perspective. It is worth noting, Fraser’s organizational style mirrors Dakin biography: there are parts I – VI. divided into subsections for easier reference, as well as an extensive glossary, and end notes that run for pages. Fraser also includes an extensive selected and annotated bibliography for those who seek to research the topics further. While Dakin focuses specifically on Ms. Eddy, Fraser’s book goes well beyond the Beloved Leader’s history and talks more about the Church, and consequences of following Ms. Eddy’s teachings. Only in Sunday School we used is, God is Everywhere… we are His image and likeness. Matter is nothing. Emerging Gently calls it “mental gymnastics” and by the age of five I’d mastered it and could recite it all back like a pro. Even with a 20+ year age gap, Fraser’s Sunday School experience mirrored mine so closely it was eerie — I never had the car sickness issues, but I did have regular rounds of common cold which would leave trails of keenx unreal behind me. We also had a young man who attended my Sunday School die, not quite as dramatically — no one showed up at his parents house in protest, but it still sent ripples of discontent through the Sunday School and several of his friends and family (myself included) have since left Christian Science. Fraser goes on to discuss, albeit briefly, Ms. Eddy background and those she influenced, touching on the New Thought and New Age movements, moving on to cover the rise of Christian Science, and a quick summary of services and church activities – most notably the lack there of, and the lack of diversity as well. Fraser hits rather close to home as she describes something I’ve seen played out again and again, both at the church I attended growing up, and over and over again at Principia. The fourth section of the Preface is entitled I Tip My Hat, acknowledges Ms. Eddy has inspired “intense reactions” and goes on to remind readers that the Church has done an excellent job of keeping apologist literature at the forefront and successfully lobbied to maintain protective legislation. Fraser rightly argues that the information the Church has left out should be made available, and more should be done to show how they have seriously eroded the rights of children to equal protection under the law. Fraser makes it quite clear that while Christian Scientists are welcome to believe what ever they’d like, but they need to have their actions taken to task. I agree, Christian Science has a lot to answer for and it should not be allowed to hide behind its polite middle class respectability any longer. Knowing what I know now, and having read Dakin’s biography, I look forward to re-reading God’s Perfect Child with a fresh perspective. That is about how I remember it, though I don’t remember a whole lot. This a really good account. When I was first transferred to the middle school wing, I remember they tricked me and said I’d only be there for a night. Then they didn’t let me leave and shortly afterward they decided that no one was allowed to leave their rooms there – maybe because they were mixing people with colds with people with measles and were hoping to avoid cross-contamination? It didn’t last. I also remember that damn clapper on the TV and how every time someone coughed it would turn off. Also the milkshakes. They went through the trash to see who wasn’t drinking theirs. If you didn’t have the appetite for a milkshake you were getting sicker and went to campus house. I remember very little about campus house. Except I can corroborate the no baths thing. I must have worn the same underwear for days. Gross. Oh, and remember how kids could get vaccinated so they could leave campus? Except I swear they vaccinated kids who had been in the quarantine wing and had clearly been exposed. I want to say [students name redacted] got double measles from it. I suspect I only had a cold and they put me in the the measles area. Because I was fine for a long time before I got really sick… Though I could also have been in denial. While I had heard about Ms. Eddy’s Christ and Christmas poem growing up, I didn’t read it until just recently, when I came across MJSmith’s analyses of it on The Ark of Truth Mother’s Hood. I am more acquainted with Ms. Eddy’s hymn/poem Christmas Morn as it regularly made an appearance at Christmas Hymn Sings, along with the generically Christian Joy to the World. MJSmith makes some interesting observations and draws some interesting conclusions from the poem and illustrations, so I decided to find a copy and see for myself. Christ and Christmas is not in our personal collection, but Google Books and Archive.org have copies available online. I was never much for poetry analysis (my high school English teachers will agree), and I’m sure if I attempted to analyzing Christ and Christmas it would devolve into a study in esoteric minutia and I would likely come to all the wrong conclusions. I will leave the musings and analysis to MJSmith and the Discover of New Christian Science, Rolf Witzsche. Below is the full text of the poem, a YouTube video of Wizsche’s “New Christian Science: Christ & Christmas,” and links to MJSmith’s analyses. A quick note: There is much criticism of Christian Scientists by Christian Scientists about the “right” and “wrong” ways to practice, as well as selective/intentional ignorance about certain aspects of the religion. I feel that these things which may be preceived as controversial should be made more broadly available so that people can judge for themselves — and I’m sure it will make for interesting conversation around the dinner table.